This is going to be a very busy week here at The Legal Genealogist, as the spring conference season is in full swing and there’s a lot of preparation going on. So in honor of this weekend’s Spring Seminar of the Root Cellar Sacramento Genealogical Society, let’s take a look back1 at a couple of terms that we may need to know as genealogists … and that came up in a very interesting California court case. The terms: moiety and partition. A “moiety” in law generally refers to a one-half interest in real estate.2 An entirety in real estate, by contrast, means the whole parcel.3 But the term “moiety” is broader than just a half-interest. The definition of “moiety” notes by way of example that joint tenants — two or more persons who own land by a joint title4 — are “said to hold by moieties.” Used this way, the term refers to any set of roughly equal parts. Whenever there’s a moiety (or, for that matter, any joint or common ownership) of land, there’s also a good chance that there will someday be an action for partition. That’s because a moiety in real estate only creates a right to roughly equal shares, and joint and common ownership gives all owners some rights to the land, but none of these ownership forms answers the question of who, ultimately, gets what part of the land. The definition of partition is, simply, the division of lands held jointly or in common by multiple owners into distinct portions, so that each takes sole ownership of a separate part.8 Usually, the party who wanted the land divided would file an action for partition. If the court granted it, it would issue a judgment, called a judgment quod partitio fiat,9 ordering the partition to occur. The actual division — deciding who gets what — was often done by a group appointed just for that purpose, called a commission of partition.10 In older records, those folks might be referred to as extensores.11 If the proposed division was accepted and approved by the court, one or more deeds of partition12 would be entered, giving each landowner single title to his or her part of the land. For a GREAT example of partition, the California Supreme Court case of Emeric v. Alvarado, 64 Cal. 659, 2 P. 418 (Cal. 1884),13 is a wonderful read. It’s a decision on an action to partition a ranch of nearly 18,000 acres known as San Pablo in Contra Costa County. The opinion itself is an amazing history lesson: all about land grants in early California (the family patriarch, Francisco Maria Castro, applied for his grant in April 1823) and all about how land inheritance worked under the Mexican and Spanish laws in effect at the time. Now think about that for a minute. The case began in 1867. 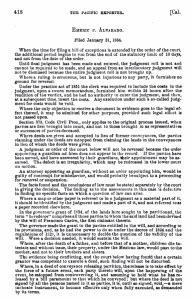 An interim judgment — that’s what interlocutory means15 — was handed down in 1878. That’s 11 years later. And this appeal wasn’t decided until 1884. Another six years. So it’s an interesting look in how far people are willing to go when there’s a lot of money (or land) at stake, and that’s fascinating for anyone who’s interested in the law — or in what families do. If you’re a descendant of Francisco Maria Castro or researching any part of this family, the opinion names his wife (maiden name included), all 11 of their children, the spouses of three daughters, six grandchildren (and the spouse of one granddaughter), and two great granddaughters (and the surnames of their spouses). And it gives the full names of 31 minors, with six surnames, with interests in the estate based on their ancestors for more research. Judy, I’ve been waiting to see what you would find in CA records. This case is a great example and interesting, however, I help with indexing Probate Records at the Center for Sacramento History and there have been a number of Probates that start in the 1850’s and have not been completed until 1905, 1910, 1912 & so on. Have to wonder if there is anything left in the estate after 50-60 years! Depends on what they start with, I suspect — in this case, there was enough land involved that I suspect it was still pretty darned valuable even after the dust finally settled.